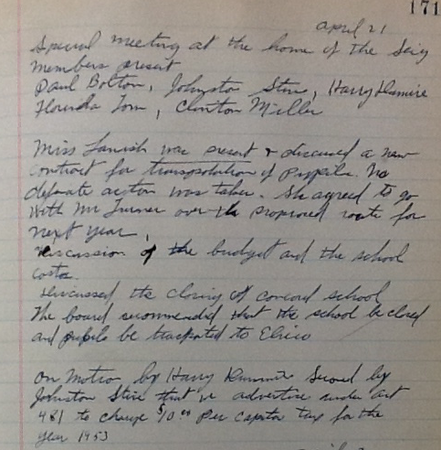 In 1911, the Concord School became a part of the Loyalhanna Township Public School System. The school was governed by a school board and had served surrounding community for eight grades. Once the children completed eighth grade they could choose to attend a high school. In most cases, children from Concord desiring to further their education, selected to attend the Saltsburg High School. 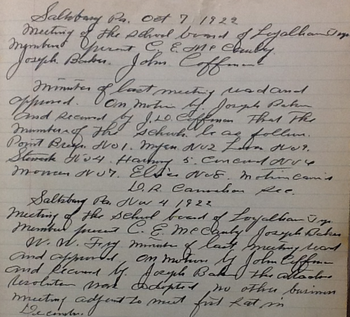 Just prior to Concord closing in 1952, the Loyalhanna Township School District entered into an agreement to become a part of the Saltsburg Joint School Authority. Ten years later, Loyalhanna Township School District dissolved and officially became a part of the Saltsburg School District. Later, this district merged with Blairsville and is now known as the Blairsville-Saltsburg School District. Concord School was one of eight schools in Loyalhanna Township School District; Point Breeze No. 1, Myers No. 2, Love No. 3, Stewart No. 4, Harmony No. 5, Concord No. 6, Moween No. 7, and Elrico No. 8. 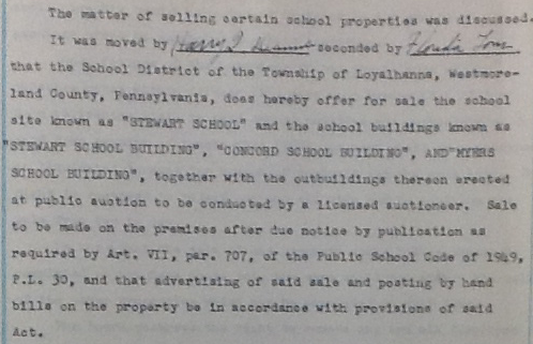 On April 21, 1953 the Loyahanna Township School District has approved the closing of the Concord School. On November 26, 1955 the Concord School was placed for auction and to be torn down upon being purchased. No record exists if the building was ever sold, but it was retained as a standing building on the Frank Bash farmstead. In addtion to Concord School, there were researched accounts of seven other Loyalhanna schools built later than Concord. Harmony School began similar to Concord as an Independent School but was built several years after Concord. The Concord School is believed to be the oldest of the Loyalhanna Township School Distirct's schoolhouses. Public schools of Loyalhanna, not formally independent, were Myers, Stewart, Elrico, Moween, Love, and Point Breeze. Elrico school was later replaced by a two-room school in 1930. By 1956, the Willard School replaced all remaining Loyalhanna one-room schools. This building, now known as the Saltsburg Elementary School, was located in Loyalhanna Township on the area called the Kiski Heights and it was closed in 2010. Loyalhanna Township School District (1911-1961). Board Minutes. Blairsville-Saltsburg School District, Blairsville, PA.
Peace, D. H. (1960). Loyalhanna Township Past and Present: A History of Loyalhanna Township, Westmoreland County, PA. unpublished thesis. Indiana Univeristy of Pennslyvania: Indiana, PA.